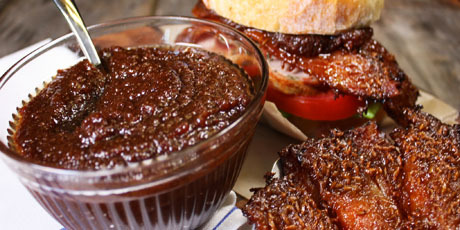 Whip up a batch of bacon heaven with this unique jam topping! 1. Place your favourite saucepan over medium high heat. Toss in the bacon then pour in a big splash of water. Stir frequently with a wooden spoon. As the water simmers the bacon will begin to cook. Then as the water evaporates the bacon will render, releasing its fat. Lastly it will crisp as the fat left behind heats past the boiling point of water into the flavour zone. Keep an eye on the pans heat, adjusting as needed, keeping the bacon sizzling but not burning. Stir and be patient, until the bacon is evenly cooked, nicely browned but not particularly crisp, about 20 minutes. 2. Remove the bacon and strain off all but a quarter cup or so of the drippings. Pile in the onions and patiently brown over low heat until they are soft and caramelized, about 30 minutes. Add the bacon back in, accompanied by the brown sugar and water. Continue simmering until the water is absorbed and the mixture becomes thick and jam-like, about 20 minutes. Splash in the whiskey, reserving an ounce or so for the finish, and cook until you get back to the jam consistency, about another 25 minutes. Carefully transfer the mixture to the food processor, pulse it with the reserved whiskey and the vinegar, and you’ve got a smooth batch of bacon heaven!